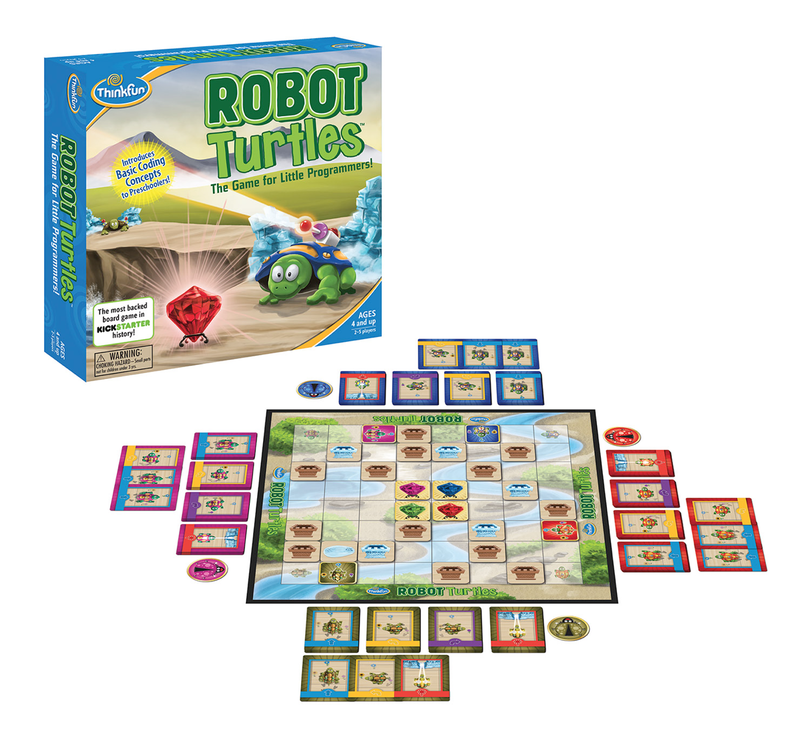 I was so happy to get a game ThinkFun called Robot Turtles to review. The boys love games. The boys were so excited to play! Mica opened up everything. There is a lot of instructions to the game. I found it easy to watch some YouTube reviews of the game before playing. I'm so right brained that sometimes I get things better after I see how it's done/played. 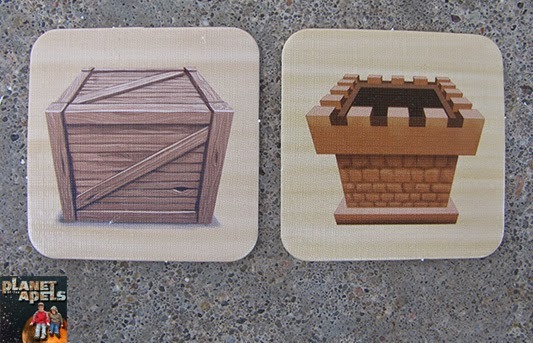 It's the most backed board game in Kickstarter history. It teaches preschoolers the fundamentals of programming, from coding to functions. Once it's explained how to play, kids get it. It takes 5 to 15 minutes to play. I think this is a great quality. Kids just don't have the attention span for long games. It provides endless learning opportunities. Before you know it, your little one will be writing computer games rather than just playing them! 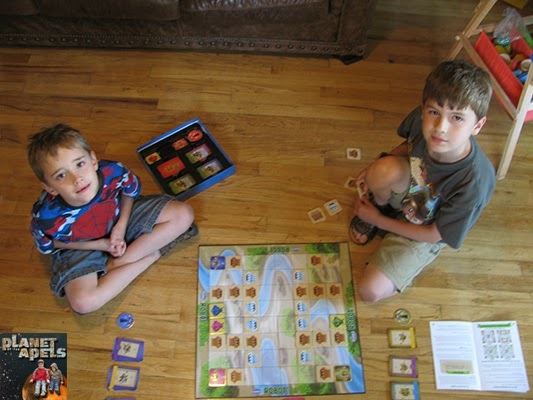 You may be wondering just like I did how kids can learn animation, while playing a board game? Seeing the cards up close may help you to understand. 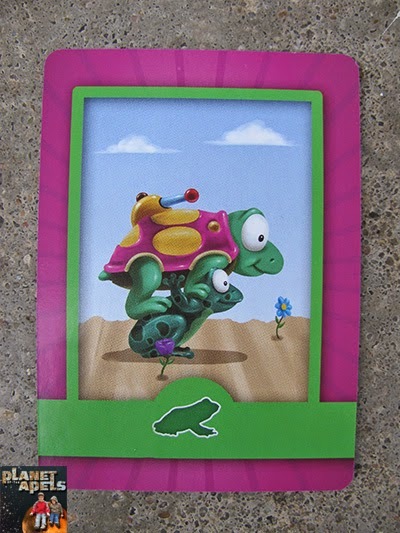 These are the card that kids use to move. 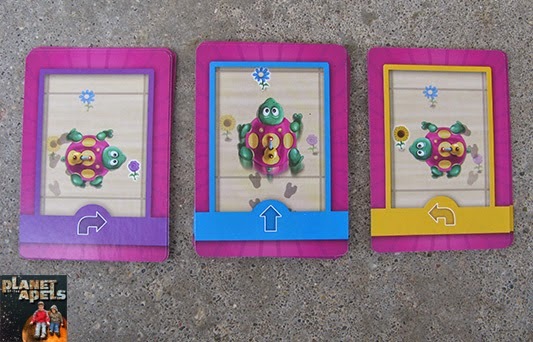 They move their turtle character just like a controller for a video game move right, straight, and left. Another card kids can use is the zap card. This card has the ability to zap the road block (ice) to a puddle of water to move forward. 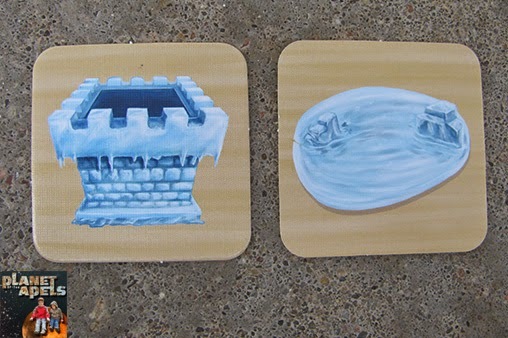 The front of the card looks like ice; once zapped the backside of the card looks like water. Turtles can't walk through ice, but they can pass through water. Other road blocks is the create and stone. The create can be moved by the turtle's head, but only when the turtle is facing forward. The stone can not be passed at all. The turtles have to walk around the stone. The turtle is the character. 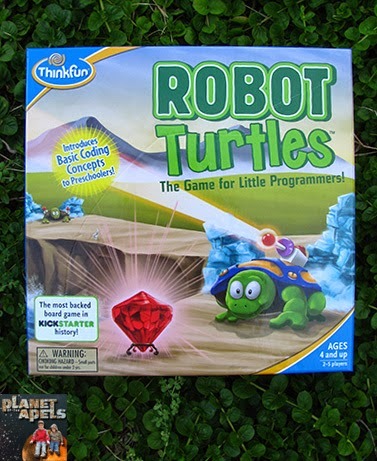 The object of the game is for the turtle to reach the gem. 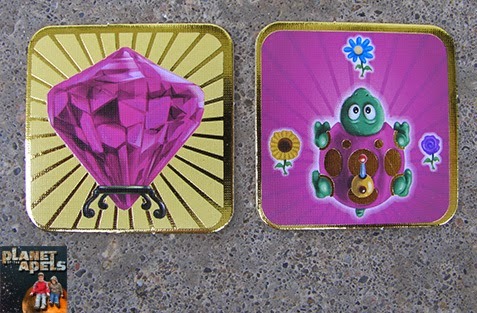 There are 4 turtles, and 4 gems. 2-4 players can play. 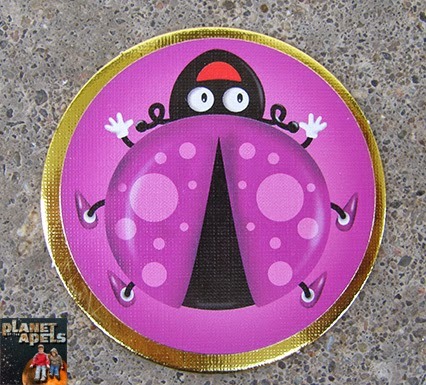 There is only 1 bug token. This token is used if a child decided they turned the wrong direction. It's an "I messed up, and changed my mind token." 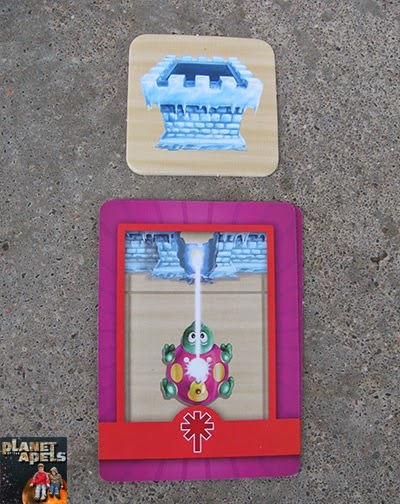 There is a Function Frog card that is only used for more advanced players. From what I understand this card is used when kids have a pattern going in their animation. We haven't played with this card as of yet. My kids loved the game! We played it 3 times in a sitting. It seems like a game for little kids. Ideally preschool to 2nd grade would be the age that would enjoy this game. While Isaak (age 6) got into how the game is played, Mica (age almost 9) got into the Turtles characters, and wanted to go online to check out all the extras they have on their website. The directions were confusing to me, but now after watching how it's played on YouTube I get it. It's much easier than I was trying to make it. I think all the different card had me overwhelmed. I'm a very visual person. My brain just thinks better with seeing it in action than reading. I love how the game helps with left and right. My goodness left and right is something this newer generation has problems with. I see it in their martial arts class all the time. Kids just don't know the difference between left and right. This game reinforces directions. I can see how it helps them learn how to animate. Every card they pick to move, and zap goes in one long straight line from left to right. If you've ever done coding, or played with the program Flash, or Dreamweaver they work just like that. We don't know how we feel about there not being a winner. Everybody wins in this game. I think the reality of their being a winner in games builds character on the loser's part. We all really enjoy that the game board can be set up different ways to give variety each time it's played. I enjoyed playing. I actually got more into making sound effects when I was playing, and not video taping. My kids (especially Mica) have always gotten into making sound effects. I think they liked hearing me make sound effects. Instead of hearing me say, "Stop it!" I was joining in. looks like I can play that with Bo et Obi. They are into games as well and summer break is still long :). TFS..
My Grandson for some reason, likes turtle anything. He is a little young for this game right now, but who knows. He may understand it better than I would. That's something that you noticed left/right being a challenge in martial arts. I am genuinely surprised to learn that there are still board games. I don't see how they can compete for the kids attention with computer games. Allison likes turtles. I bet she would love this game. Like you, I am more of a visual learner, so those video tutorials are always a lifesaver when it comes to things like this!